Can you see the crane? Rose Watson working on one of her 1,000 "Lillies"
EDITOR'S NOTE: S. Rose Watson is showing over 300 drawings and paintings depicting 1,000 lilies drawn in response to a loss (at Blue Moose Café, 29 High St.). She will donate $5 of each sale to Brattleboro Area Hospice. Below are a few notes by Rose about herself and this special project. There are many things that I decide I canít do, like draw Lillies [Rose's styling] with my left hand. 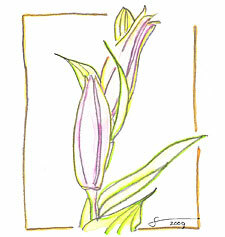 I drew 730 Lillies with my right hand. 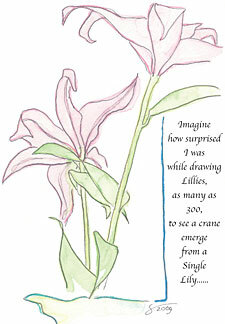 With each Lillie I learned more about myself and I learned also to open my eyes up to new "seeing." 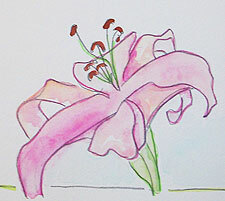 At 300 Lillies, suddenly a crane emerged as I was drawing. A paper crane: head dipped down, wings spreading boldly out to each side and tail folded behind itself. I majored in Art at the University of Wisconsin-Madison, and it was such a debilitating experience that it has taken me years and years to recover. A big thank you to Julia Cameron for The Artistís Way, which I did with a group of women and birthed the Twilight Tea Lounge at the end of the 12-week session. Also I may be the only adult allowed to take the Childrenís Studio Class at River Gallery School, where I copied work by the other kids in the classes to heal my crumpled wings -- and, boy, was I flying after remembering the freedom of my inner childís creative desires! Next I started drawing and painting with Betsy MacArthur, who brought me fully into the beauty of line drawing ... and drawing and drawing. 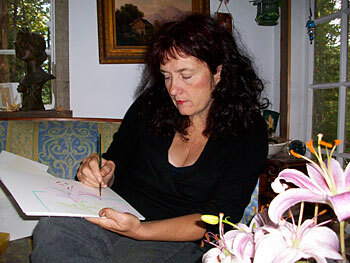 She drew up to 10 self-portraits a day and lots of flowers; she never uses an eraser, just lets the drawing create itself. This is the learning I took into the Lillie project, though I confess I used my eraser at least 10 times!